With a series of events taking place in both Storyhouse and Chester Cathedral to mark Chester Refugee Week, in addition to Moving Stories at Chester Little Theatre, We Are Chester’s Paul Crofts went along to Storyhouse for a preview of a major new work. Take Refuge Under My Shade forms a central part of the eclectic mix of community-based events on offer in the city from now until 25 June. Photos: Storyhouse and Angela Ferguson. I must admit to not having seen many pieces of contemporary dance and so I was a little apprehensive when I visited Storyhouse for a preview of a specially commissioned piece which is being staged as part of events in Chester to mark Refugee Week. Staged in the intimate space of the Garret studio theatre, Take Refuge Under My Shade is the work of Cheshire-based dancer, choreographer and theologian Claire Henderson Davis and dance artist Bettina Carpi. The choreography interacts beautifully with an original soundtrack by composer Gary Lloyd, recorded at Glasgow Royal Concert Hall by the Scottish Session Orchestra conducted by Adam Robinson. Under this same banner, Claire and Bettina have also curated a series of Chester-based community events taking place at Storyhouse and Chester Cathedral providing all ages with ways of participating in Refugee Week locally. The piece opens in pitch black, and, as the light from a single spotlight grows we see a pile of abandoned clothes. Slowly, limbs start to emerge and then retract, pulling items of clothing into the pile as if pulling them close in the same way that a child clings to a comfort blanket. As the two female figures emerge, one carrying the other on her back, so begin the interweaving stories (in English and Arabic) of three pregnant women: a Syrian woman journeying to the UK, a British woman describing her struggle with poverty, and the story of Mary visiting Elizabeth to share her good news. The piece explores themes of loss, endurance and new beginnings through a female lens, not in a linear or literal way but through evoking the inner, emotional journey of the women and we see just how differing cultural and religious beliefs shape their lives, hopes and dreams. For me, the overriding emotions were loss and hope. The terrible situation of having to leave one’s homeland, not being able to provide for your family, fighting to stay alive every single day against all the odds but, crucially, taking hope from small but significant acts of kindness and the promise of something better to come, where there is life, there is hope. 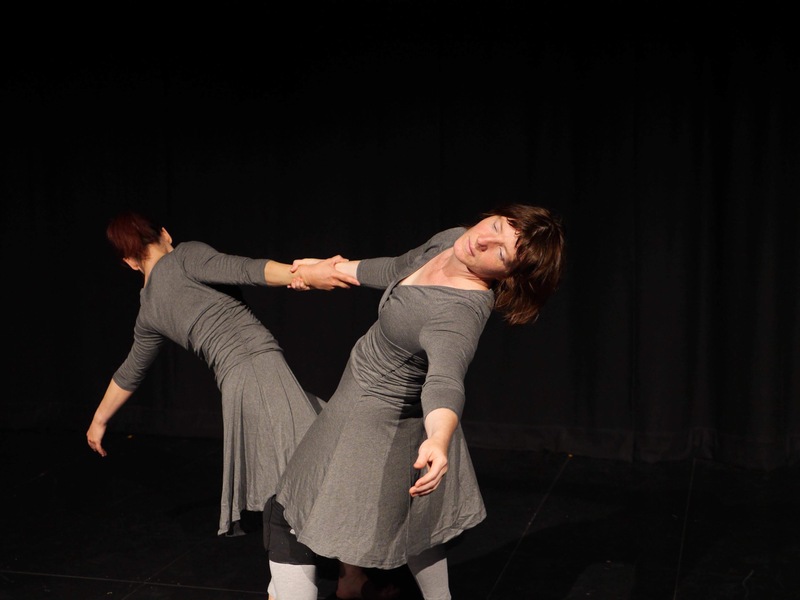 The dance element, beautifully performed by Claire and Bettina, draws you in and I was captivated by their every move, so much so I barely made any notes and forgot to take any photos for this review. Their trust in each other is absolutely clear as they perform this incredibly intricate and expressive piece, telling each story whilst taking us on a rollercoaster of emotions from despair, loss and finally, hope. The piece is interwoven with a soundtrack which includes an original score by local composer Gary Lloyd which uses strings and ethnic instruments including percussion to great effect, rooting the work firmly in the Middle East and adding greatly to the overall mood of the piece. Lloyd’s score has an almost spiritual quality to it and in parts, the menace of a dark brooding thriller. The soundtrack also includes moving testimony from a Syrian refugee who has lived in Chester for seven years following the horrors of life in an Iraqi refugee camp in which she had to cope with the death of her husband whilst looking after their baby, being treated like a second class citizen and having to make a startling choice to survive. We also hear a British woman recounting her struggle to make ends meet and keep a roof over her family’s head in the 1960s, her faith in humanity restored by a very small but nonetheless significant act of kindness. In conclusion, the trio have succeeded in blending dance, music, the human voice, costume, lighting and props to produce a piece which tackles head on issues such as poverty, displacement and how women are viewed and treated in different cultures in a most moving, sensitive and thought provoking way but, don’t take my word for it, why not pop along to Storyhouse and see for yourself.